This product is a universal coaxial amplifier. The amplifier works with ATSC, CATV, DBS -amp; SWM. Includes passive 2 to 40 MHz sub-band return. 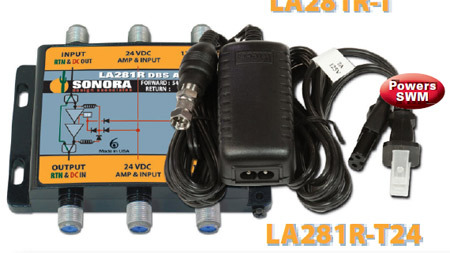 Model LA281R-T includes model PS12250 12 volt power supply. Model LA281R-T24 includes model PS242000A 24 volt power supply.